Swarovski Crystal Pendant 6039 Disk is sometimes spelt as "Disc" and is often referred to as "donut ring" or "donut bead" or "donut pendant". This is a wonderful shape for it allows all kinds of combinations and use. This shape really draws on the imagination and the creative juice. Having said that, it is also one of the easiest pendants to use, needing only a cord around it for a delicious and timeless look. The Swarovski 6039 Disk crystal pendant was launch in Swarovski Innovations Spring/Summer 2010: a timeless piece with a generous hole which is elemental to widening design possibilities. It exudes elegance in its graphic contours, with a high number of facets - giving it a particular brilliance in its round shape. Swarovski crystal Pendants are timeless for their brilliance and elegant cuts. Swarovski Pendants are amazingly versatile, especially given their large range of sizes. They can be used as striking focals, as drops, and even woven as "normal" beads in bead weaving. They also lend themselves to remarkable ease of use, requiring either just a bail, jump rings, and/or stringing materials. They are also perfectly complemented when worked with wire-work, with either the wire(s) going round the pendant or in creating customized bails for the crystal pendants. The joy and possibilities are quite endless. 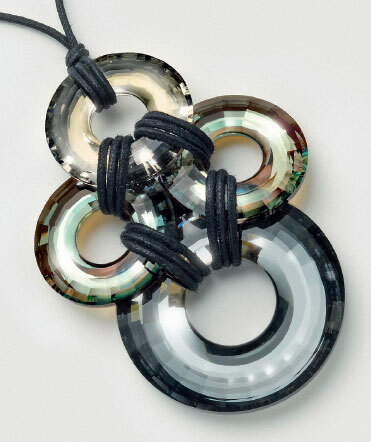 Swarovski offers their 6039 Disk pendant in a large range of colors and effects, and in a couple of sizes. In February 2012, they extended this range to include more of the newest effect (Crystal Luminous Green) launched in Swarovski Innovations Spring/Summer 2012. The 6039 Disk Pendant availability chart-matrix below will give you some better ideas as to color-to-size availability. Swarovsky Pendant 6039 Disk is available in these sizes. I so happen to have on me some lovely photos of the Swarovsky Crystal Pendant 6039 Disk in the latest effect. (Photo Credit: CREATE YOUR STYLE). This is sure to whet your appetite so be forewarned!